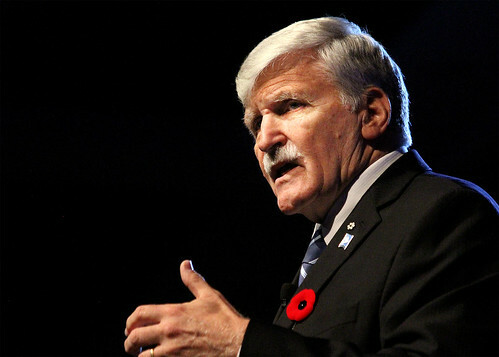 Retired Lieutenant General Roméo Dallaire spoke candidly about his mission to eliminate mental health stigma in Canada’s military at Tribute 2017. This year’s event was a salute to the brave men and women who sacrifice so much for Canada and the invisible scars they often bring home from the battlefield. Dallaire was open about the emotional traumas he experienced as the Force Commander of the United Nations led peacekeeping mission in Rwanda during the 1994 genocide. “When I came back from Africa I was not the husband that my wife married; I was not the father my children knew; I have never been the same,” he told the sold out crowd at the London Convention Centre. In June 2000, two months after being medically released from the Canadian Forces, Dallaire was found lying on a park bench in Ottawa. He was intoxicated, in deep despair and semi-conscious, having mixed alcohol with medication he was taking for depression. He was suffering from severe post-traumatic stress disorder as a result of the atrocities he had witnessed in Rwanda. Earlier in the day, St. Joseph’s cut the ribbon on its Operational Stress Injury Clinic which provides specialized mental health services for Canadian veterans. Dallaire congratulated St. Joseph’s and Veterans Affairs Canada for strengthening the mental health of veterans to support their wellness and recovery. He began his own road to recovery soon after his hospitalization in 2000. It’s a path, he admits, that he will walk for the rest of his life. This year’s event was a tribute to Frank and Kathy Longo, whose volunteer leadership and private philanthropy have been instrumental in advancing patient care at St. Joseph's. From the podium, the Longos encouraged those in attendance to find what they’re passion about, get involved and give back. It was a message not lost on those in attendance. Business leaders Kyle MacDonald and John Franklin made a $1 million personal gift in support of St. Joseph’s Veterans Care Program. The local couple come from military families and made the gift in memory and in honour of their fathers, both of whom had distinguished military careers. Their significant gift will enhance care for Veterans who call Parkwood Institute home, with needed medical equipment and will significantly expand the team’s research efforts in seeking new treatments for operational stress injuries. Chances are you’ve seen the bright green trucks of Clintar Landscape Management of London at one of St. Joseph’s hospital sites. That’s because they’re keeping the hospital grounds looking beautiful, clean and safe for the patients and residents we serve. What you might not know about Clintar is that their commitment to the work of St. Joseph’s goes beyond landscaping and property management services. Community-minded co-owners, Mike Malleck and Dave Moore believe in investing in their community, and that’s why they signed on as this year’s title sponsor of St. Joseph’s Tribute Dinner. St. Joseph's extends its appreciation to Clintar Landscape Management, as well as longtime sponsors John Zubick Limited and General Dynamic Land Systems-Canada for enabling quality and compassionate care for patients and residents in our care through their sponsorship.